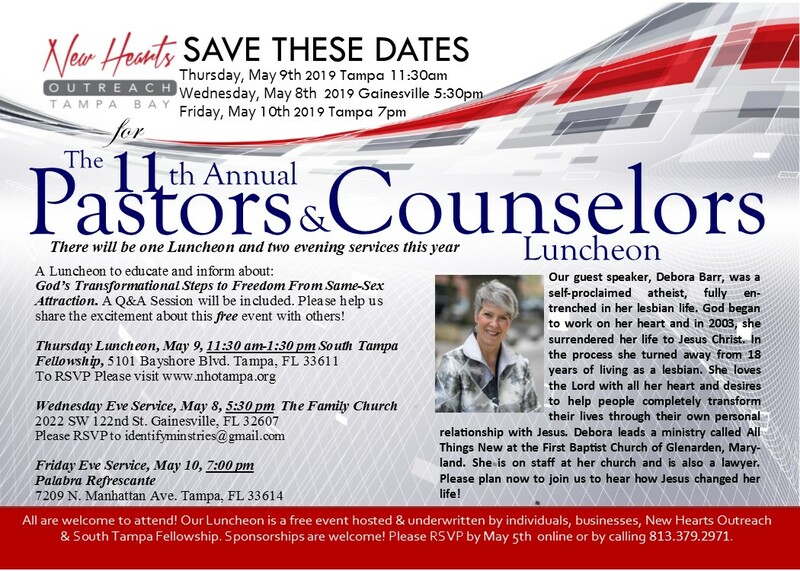 We are excited to introduce to you Debora Barr, our Spring Luncheon Guest Speaker. Debora has come from a lesbian background but now is the director of All Things New Ministry in Maryland, she is on the Board of Directors of the Restored Hope Network, and is a lawyer. Debora has given us a whole week from August the 4th to August the 11th. She is already booked in Orlando, Gainesville, Brandon, as well as Tampa. We currently have two openings in her schedule, one for Sunday May the 5th and one for Tuesday May the 7th. If interested in booking her please contact Mark at mculligan@newheartsoutreach.org or marktbm@gmail.com.